If, for example, you are looking for information of what "surge limit" means in a compressor, you won't find an article specifically devoted to it in the English Wikipedia, but you'll find an explanation of "compressor surge" under the Wikipedia article on Compressor stall. This page links to the articles devoted to the same subject in several other languages. Even if your language is not among the direct links (Italian is not, in this case), checking the articles in other languages may supply you with useful hints to arrive at the correct translation. In this case, the French and Spanish pages for "Compressor stall" are titled in a similar way: "Pompage" in French, and "Pompaje" in Spanish. This was a critical clue: the Italian Wikipedia does not have an articled simply titled "Pompaggio", but, in the article on "Compressore" you can find a section about the differences between "condizione di stallo" and "condizione di pompaggio" - which, in turn, leads to an article on "limite di pompaggio" that specifically mentions that "limite di pompaggio" is, in English, "surge limit". I thus confirmed that I could use "limite di pompaggio" in my translation. I was so glad to read this! I do use Wikipedia sometimes as a multilingual reference but wasn't sure how much I could rely on it. It's a great resource if we can use it wisely. It's interesting to see that Wikipedia's Italian article "Limite di pompagggio" (http://it.wikipedia.org/wiki/Limite_di_pompaggio) mentions the English equivalent "surge limit" in its opening line. Also, when reading the article's history, one commentator said that the English "surge" is also frequently used. Anyway, Riccardo demonstrates a very useful way of using Wikipedia for translation purposes: It's important to really needs understand the subject matter first before hunting for the right terminology. I find that, sometimes, the reading of encyclopedia articles (in both languages) can be more useful than using dictionaries. Another way of using Wikipedia for multilingual searches is through Manypedia, an application that compares the same term in different language Wikipedias. You get the results displayed side by side, which is useful for comparing the two texts and deciding how reliable the translation is. 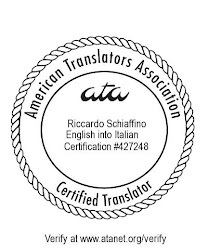 Of course, this route has the same stumbling block you mention, Riccardo, i.e., the page has to have a multilingual link in the target language. But I still think it's a useful resource for translators. I always use wikipedia to find the source. Great article and a great tip. I also use W a lot for researching things I don't understand in the original. However unreliable W might be, as a whole I think it's the most powerful source of information on the Internet for translators. The multilingual pages are really a joy to have. And Emma's addition is valuable too. I'll give it a try.